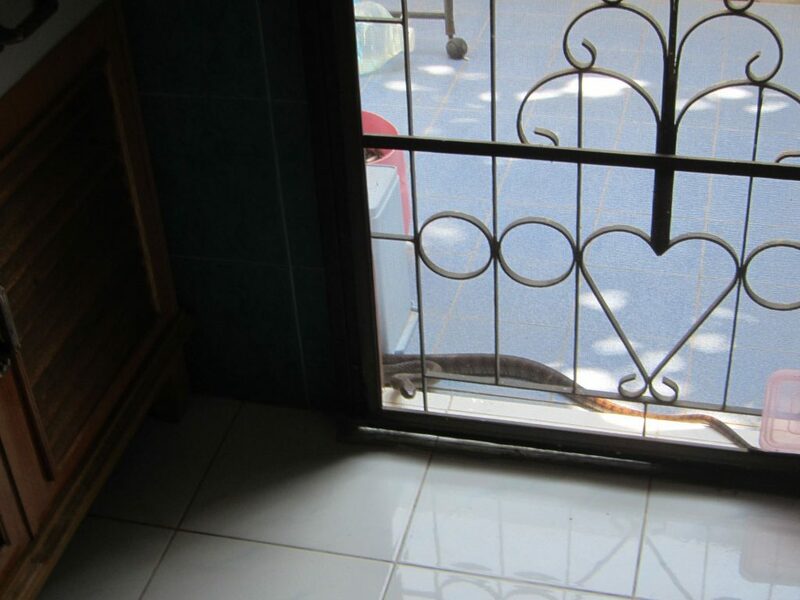 These are some photos of Thailand snakes I posted at Facebook already, but I thought I’d put them in this easy to see format. I also wanted a nice format to add these to Pinterest. 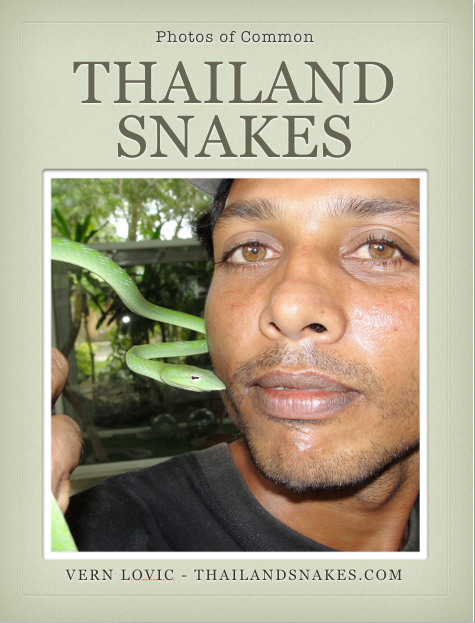 If you don’t follow our Pinterest account – go HERE -> Thailand Snakes at Pinterest. 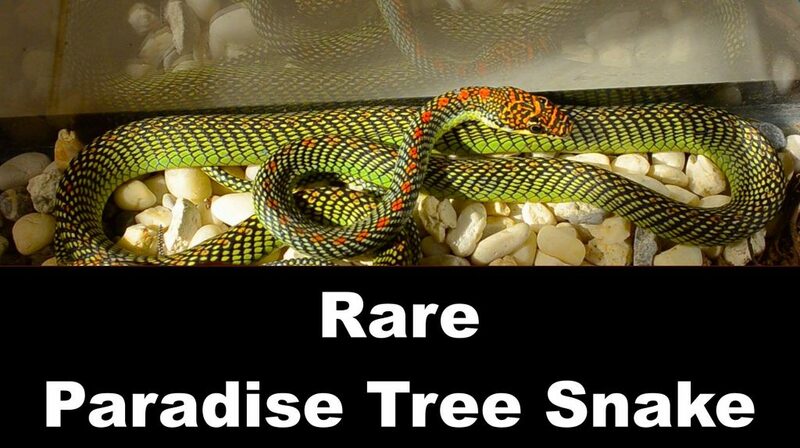 Paradise tree snake – Chrysopelea paradisi. 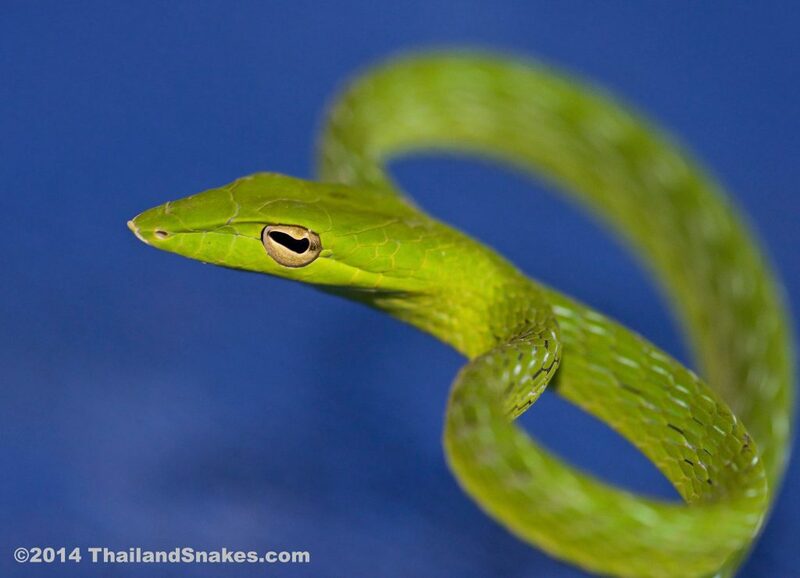 Green oriental whip snake – Ahaetulla prasina. 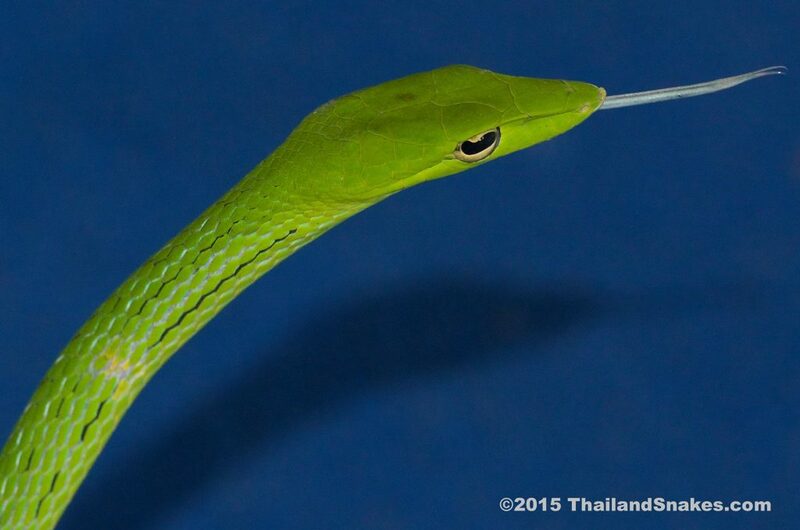 Green Oriental Whip snake. 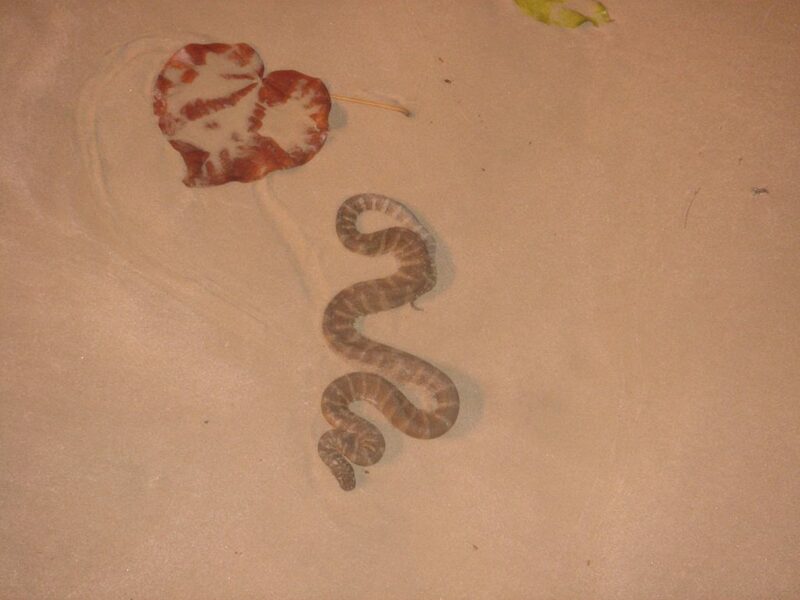 Harmless for humans. 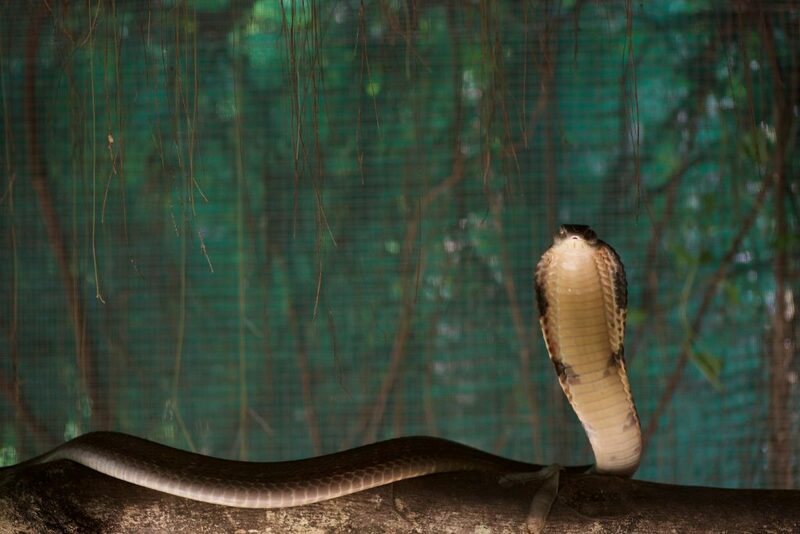 The king of snakes – deadly king cobra. 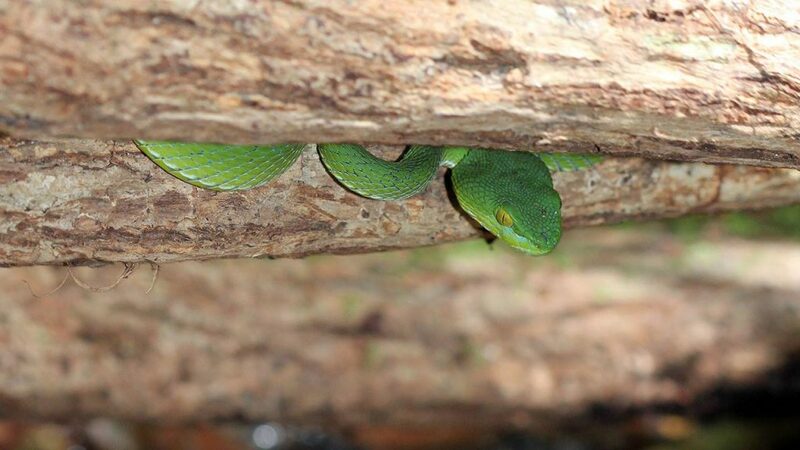 One of the first snakes found in Thailand – the Beautiful Pit Viper. 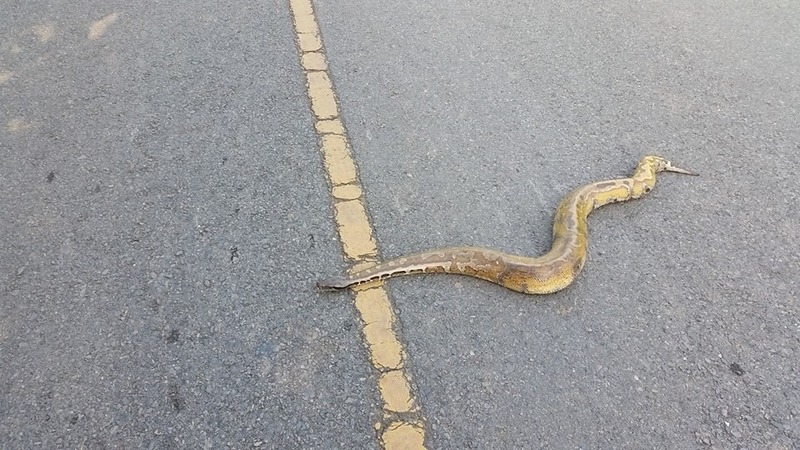 Why did the blood python cross the road? 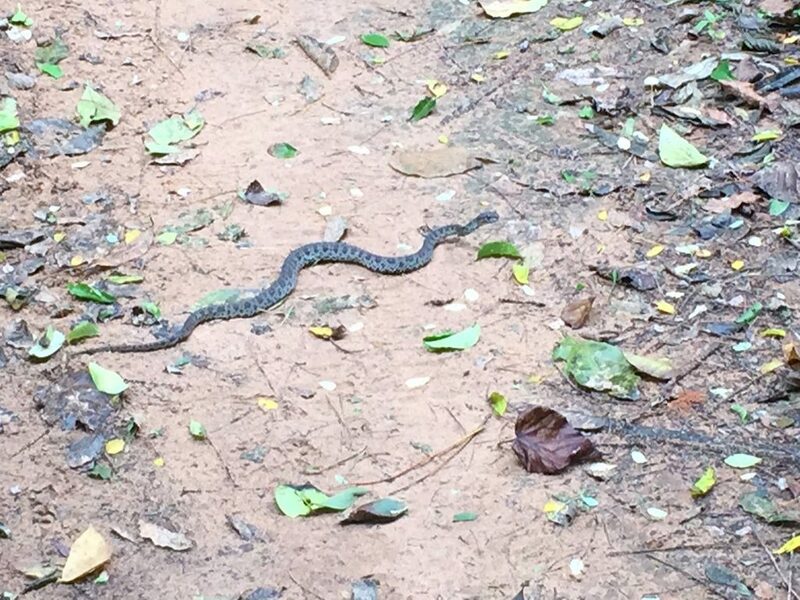 One of the amazing patterned snakes in Thailand. 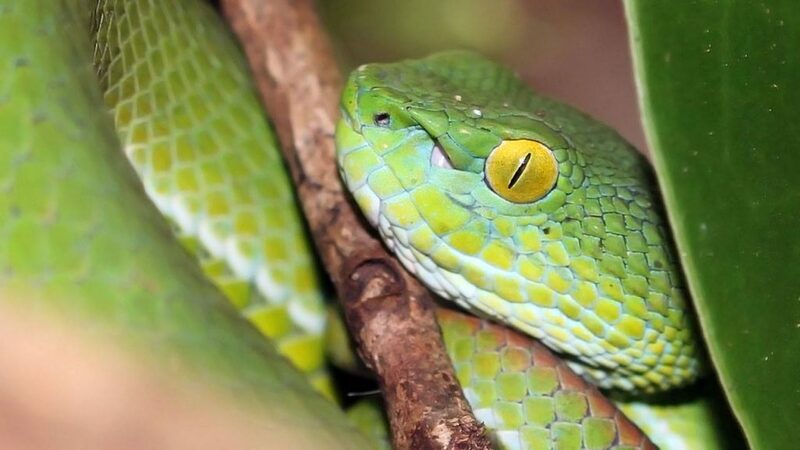 Green pit viper – dangerous. 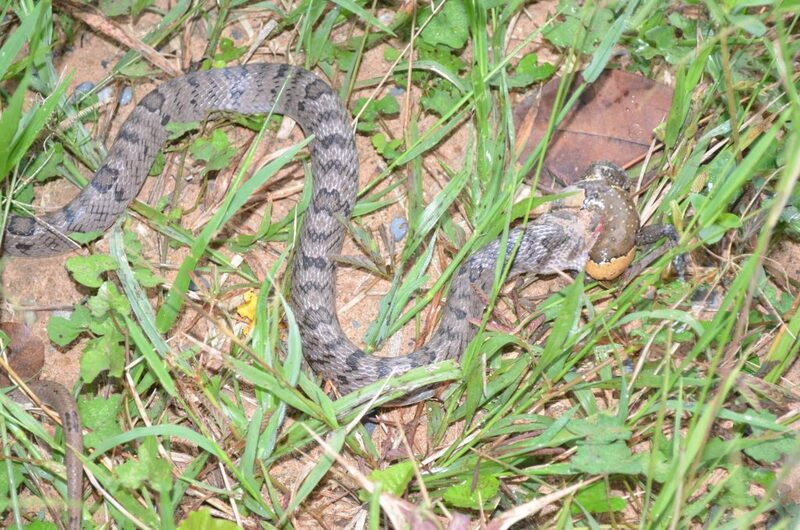 Green pit viper, likely not deadly – but severe complications can result after envenomation. 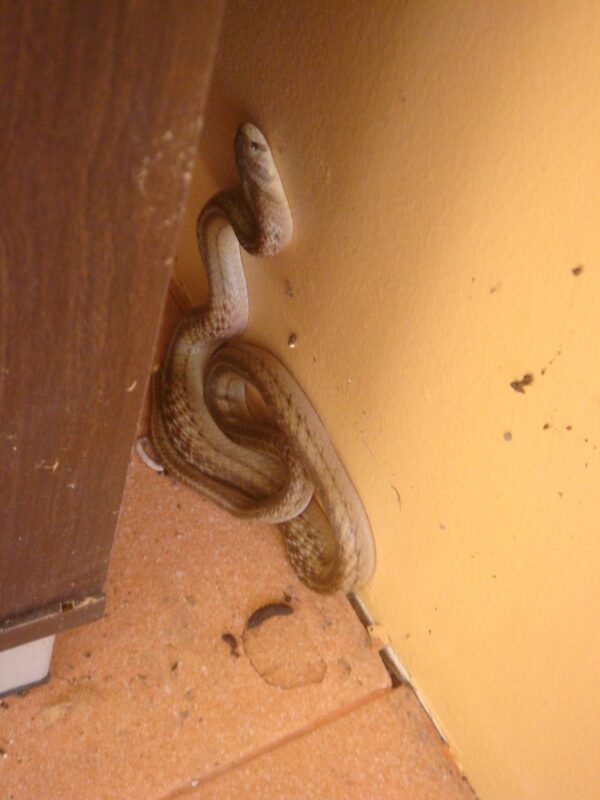 One of the Kukri snakes – non-venomous. 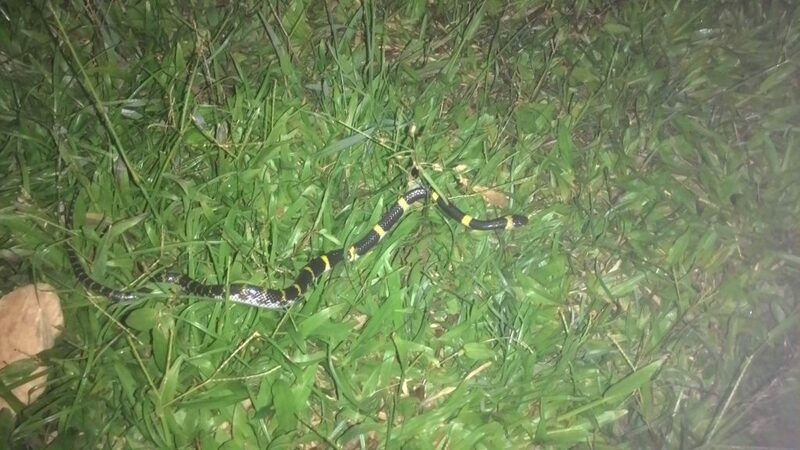 Triangle Keelback – mildly venomous, but harmless for humans. 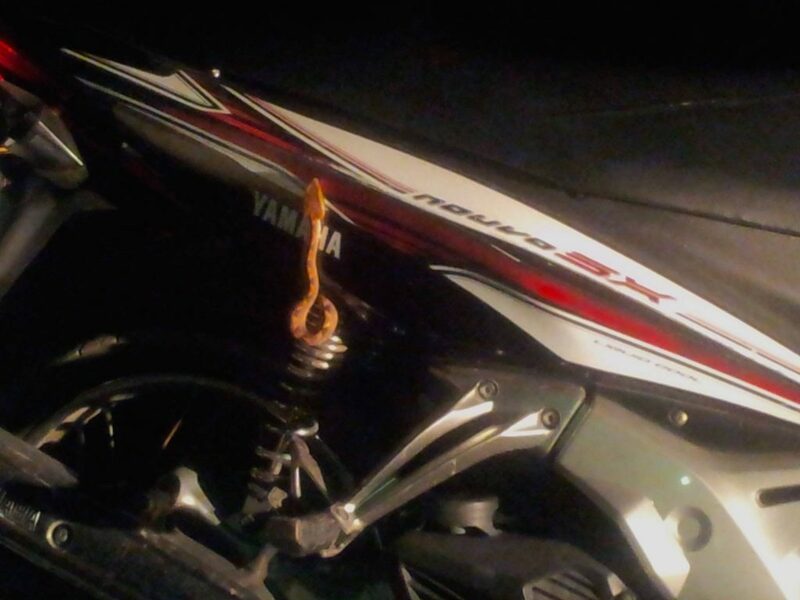 Deadly Malayan Pit Viper found its way into a scooter. 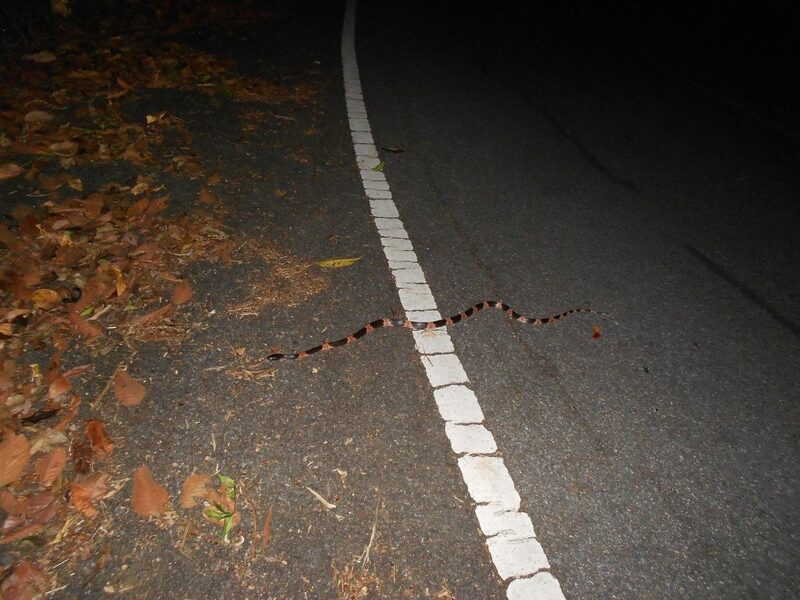 Banded krait (deadly) crossing road. 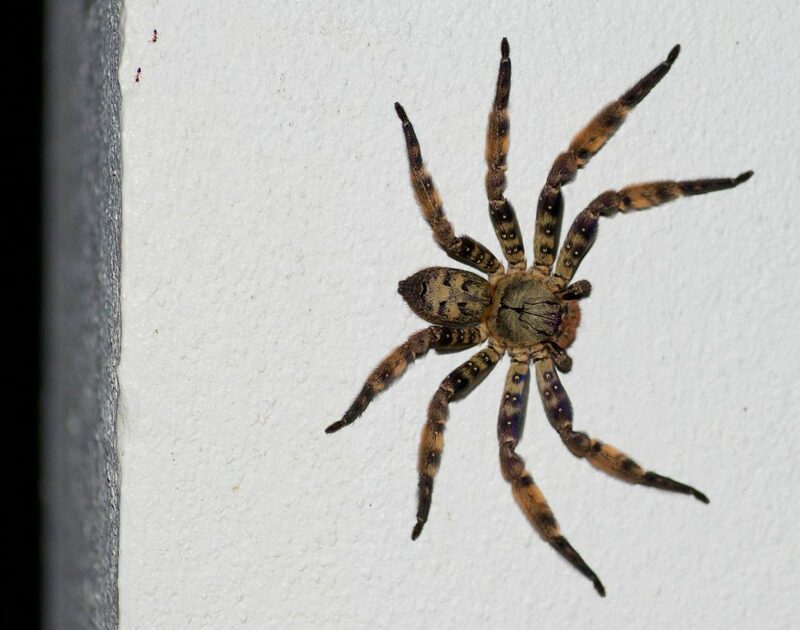 Big spider found while snake hunting. 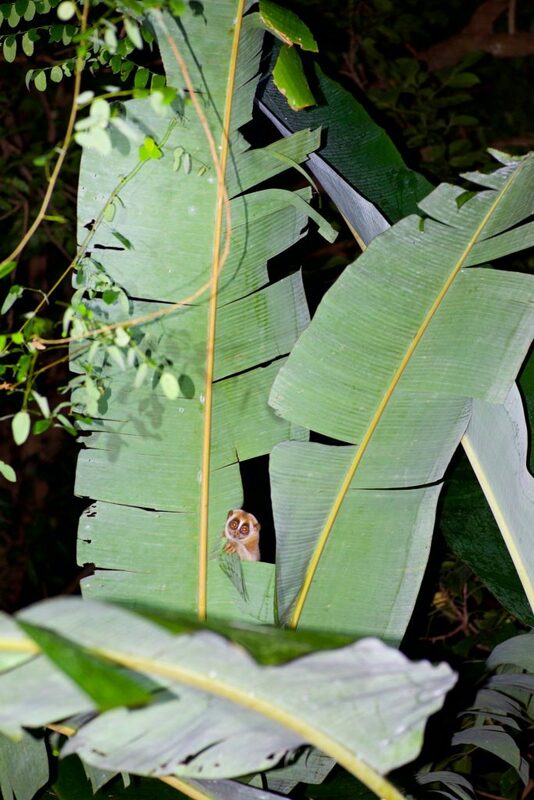 Slow Loris in Banana Tree! 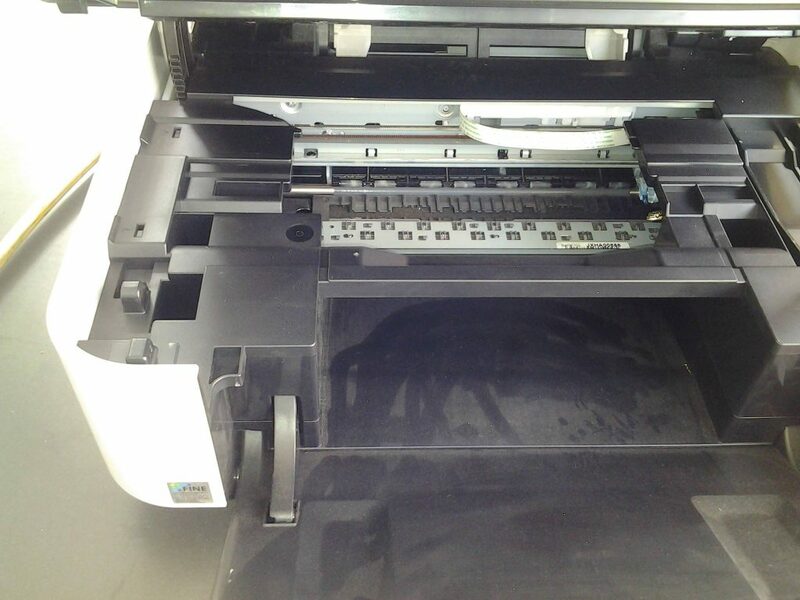 Can you find the snake hiding in the printer? 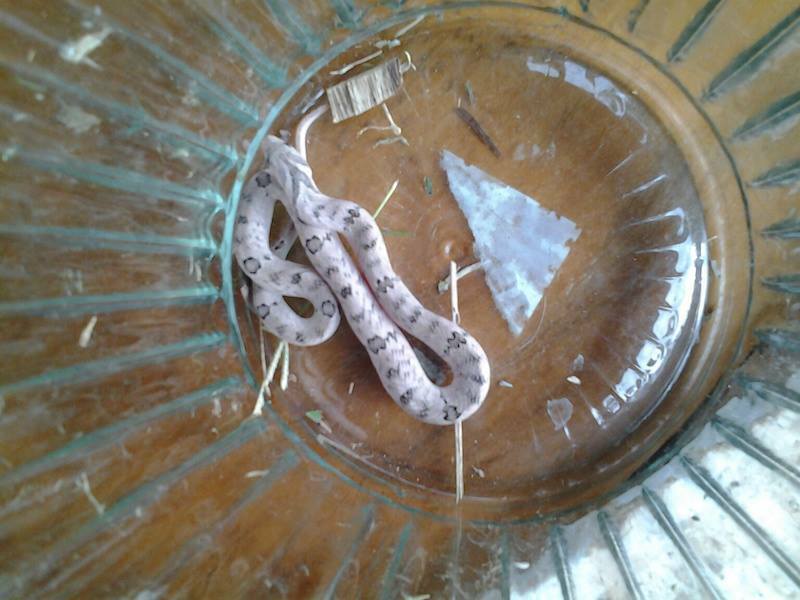 Just a kukri snake. Big rear teeth but not dangerous otherwise. 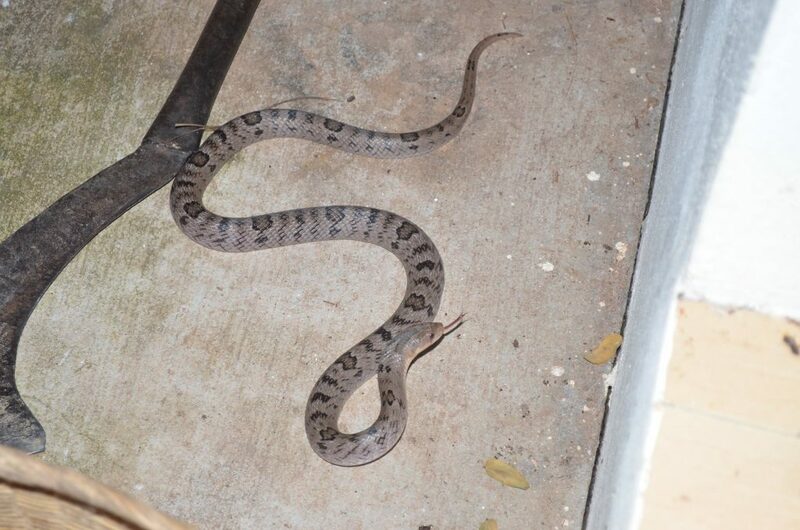 Kukri snake – harmless, but big rear teeth for cracking eggs. 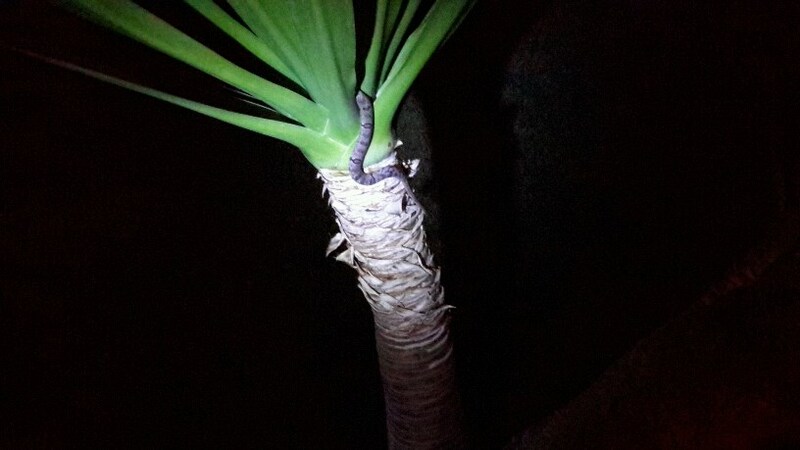 Who knew kukri snakes climbed palms? 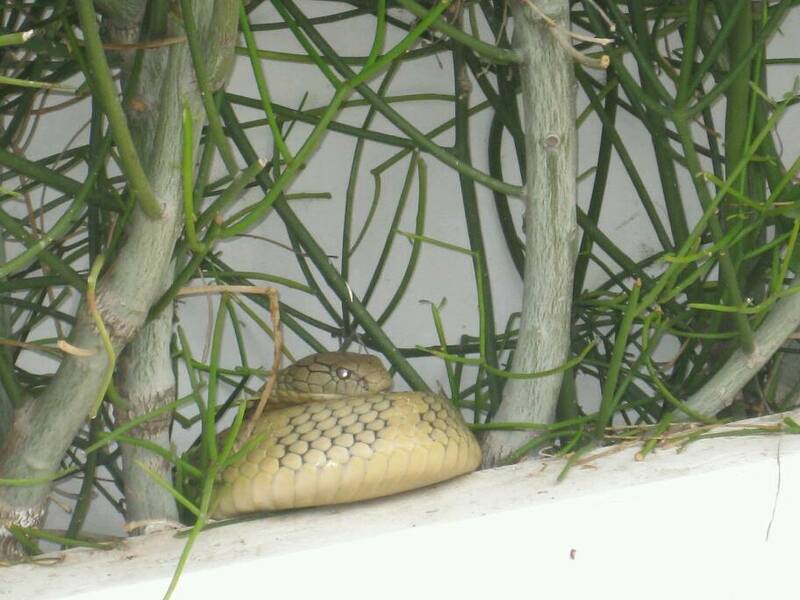 King cobra patiently waiting for the snake it probably smelled nearby. 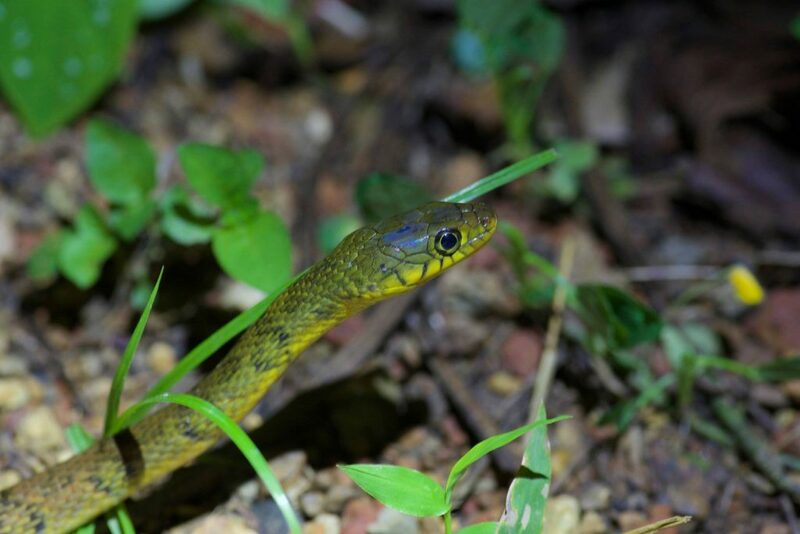 Triangle Keelback – amazing colors. 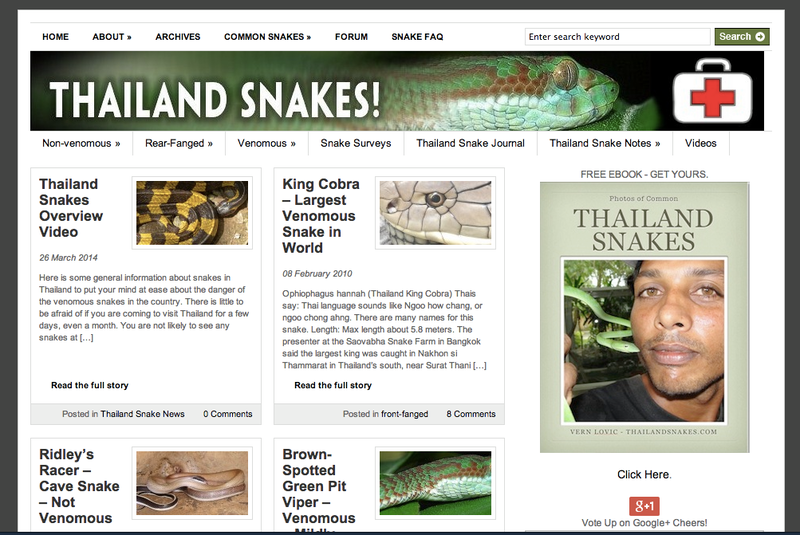 Our old site… revised now. 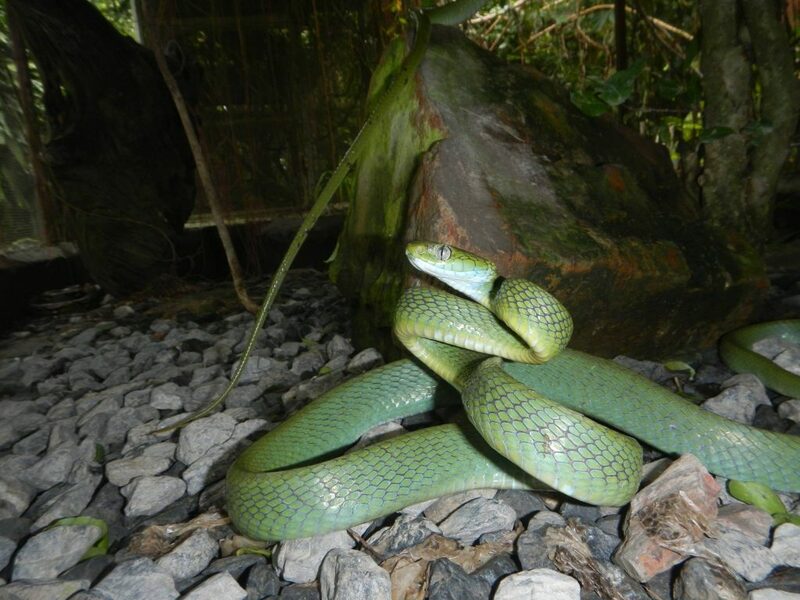 Green cat snake – Boiga cyanea – a biter, this one. 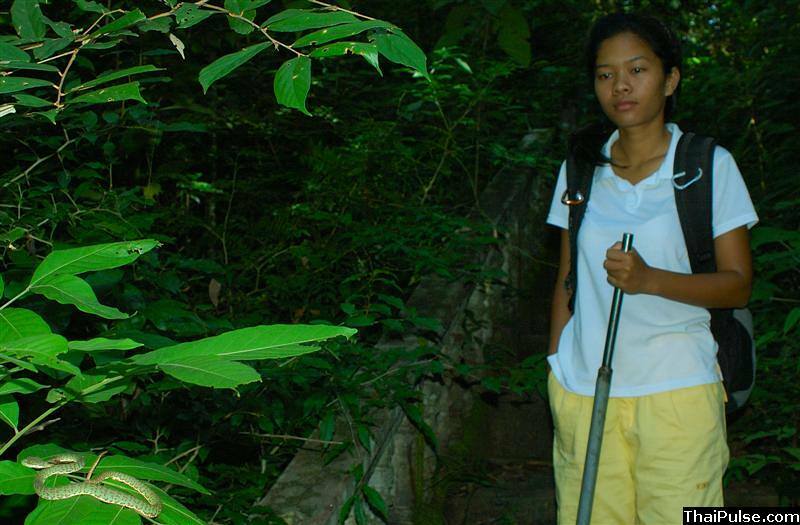 Not dangerous otherwise. 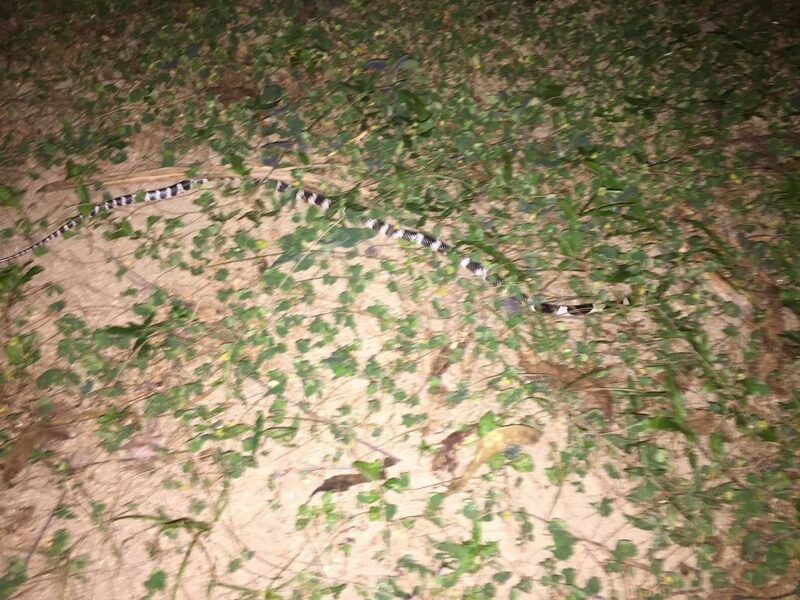 Banded krait – deadly – creeping along a wall in someone’s yard.